So everyone remembers that derision between Intel and ASRock just after the Skylake launch, with ASRock supporting BCLK overclocking on a selection of their motherboards via an external clock gen. Well, with Coffee-Lake it’s still here and ASRock has not been swayed from including it. The BCLK Engine II makes it’s appearance on a few boards, namely the Z370 Fatal1ty Gaming i7 and Z370 Taichi, and with it a refresh of market disrupting 6-core CPUs. I had a good solid week with the Z370 Fatal1ty Gaming i7 in particular and got to poke around with Coffee-Lake and the overclocking methods that ASRock’s board provides. During that time the most interesting part was simulating the i5-8400’s specifications and using the BCLK Engine to overclock this ~$200 6-core SKU to perform better than the i7-8700K from a purely price/performance standpoint. The i7-8700K was run at 5.1GHz 1-core turbo, 4.9GHz 6-core turbo at 1.385v. The Ryzen 7 1800X was run at 4.1GHz 8-core turbo at 1.45v. Now let me show some benchmarks. 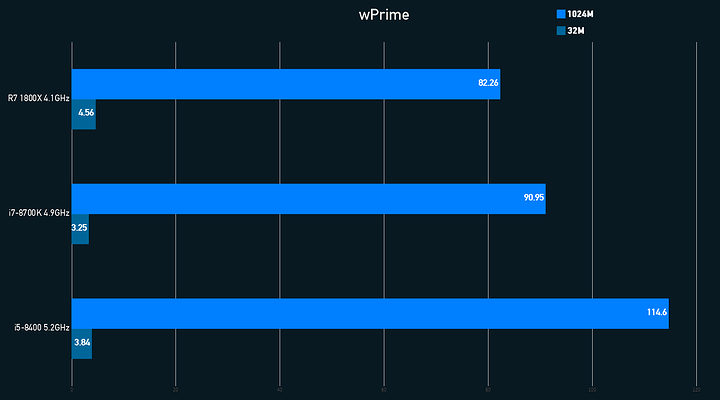 wPrime presents a more-is-more problem where more active cores/threads shows more performance, but in general we’re not looking at $170 more value in the i7-8700K from this standpoint. Sustained load temps in this test were 81C for the “i5-8400” and 88C for the i7-8700K at their respective overclocks. 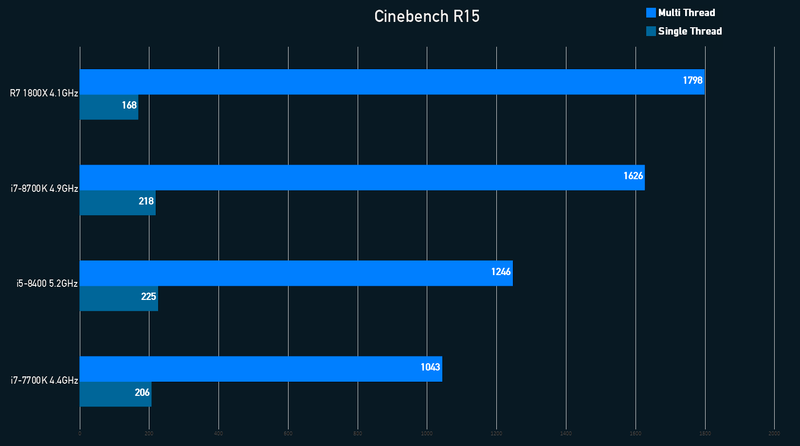 Cinebench is a good go-to benchmark because everyone has run this at least once so there is plenty to compare with. In this result we see the “i5-8400” above the i7-7700K in multi-thread, but above all others in single-thread. The 1800X takes the multi-thread crown due to significantly more active threads. Thermals in this test start pushing boundaries, with the “i5-8400” running at 86C and the i7-8700K at 91C. 7-Zip gives an antiquated but straightforward result to compare CPUs in a pseudo simulation of office workflow. With all cores loaded under close to full stress we start seeing the thermal limits make their mark on the i7-8700K, with load temps of 96C on the hottest core breaking the throttle boundary and leading to disappointing single-thread results. The “i5-8400” on the other hand is still running at a comparatively cool 86C and doesn’t throttle at all. The single-thread score of 5975 seemed to be an outlier but with the test rerun in triplicate I only ever got one score lower at around 5700. 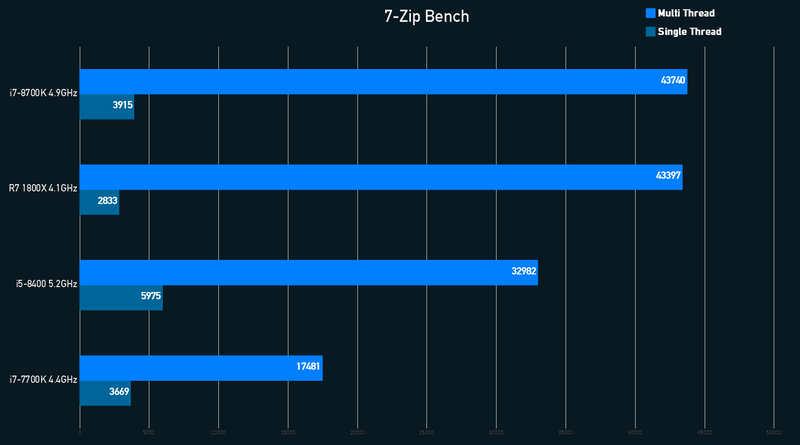 The multi-thread appears to be correct and comes in way ahead of the i7-7700K. 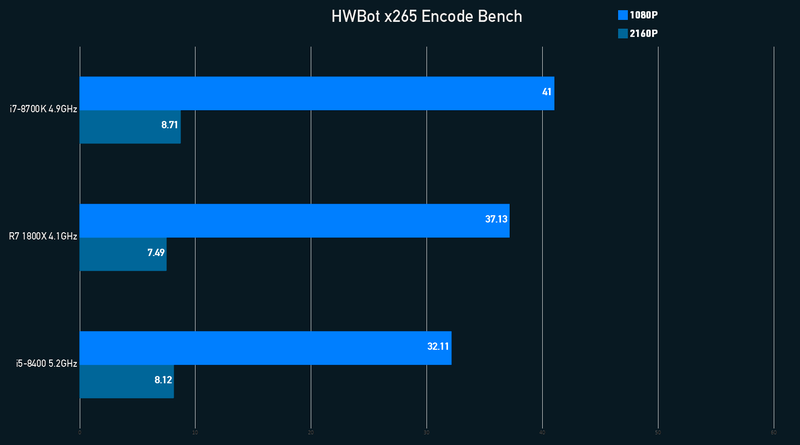 HWBot’s x265 encoding benchmark loads up a full assortment of instructions to properly stress the CPU. It also reveals the thermal limit yet again in the i7-8700K, with a single core touching 97C during the 4K test. The “i5-8400” provides admirable results at a significant discount, and even blows past the Ryzen 7 1800X in 4K encoding while sustaining temperatures of 88C on the hottest core. While the simulated i5-8400 does have the full 12MB cache that the real one wouldn’t have, we can still get a glimpse of what kind of monster this CPU might become with a very good overclock. One thing that really brings Coffee-Lake to its knees is the thermal throttle, and with HT disabled that became a significantly lesser issue allowing higher clocks and more voltage. There is no guarantee that we’ll see i5-8400s binned well enough to even achieve these clocks given that the i5-8600K exists, but even if these end up being 4.5 - 4.8GHz CPUs that’s a hell of a step up in performance for a discount. Obviously wait for more results and proper reviews but my opinion is that the i5-8400 will be the best chip Coffee-Lake has to offer against Ryzen on the price/performance front when all performance aspects are considered. Feel free to chime in with your own opinions. for our livestream we also thought the i5 8400, at least on paper, was the best deal by far. Approaching Ryzen levels of value. Thats said the 8700k is a 6 core 7700k through and through. Or if you prefer the i5 8400 approaches 7700k levels of performance at i5 prices. what bios version you running? I saw on their website they upgraded to 1.10 on all mobos that dont have the bclk engine so im guessing intel made them do it. And that would be a bummer of course. But still impressive numbers for the i5-8400. I’ll be getting a i7-8700 Non K with a TaiChi hoping to see these numbers with stability. I’m a newbie to OC so be gentle. It’s quite possible you won’t see these clocks anymore. Intel forced a microcode patch for locked CPUs, essentially rendering the BCLK Engine useless. Yeah like i mentioned above, that was to be expected. Wouldn’t a BIOS downgrade negate the microcode update? Not really looking to Max Overclock per se but rather to get the best overall performance from System including CPU, Memory, Storage, Networking.